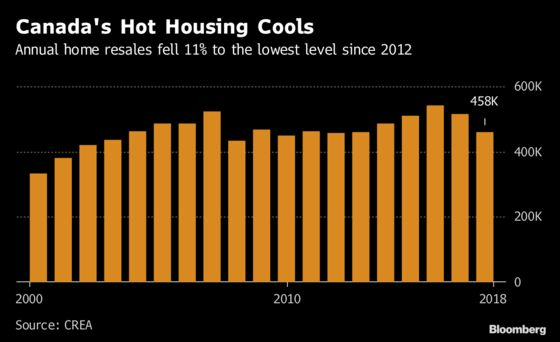 (Bloomberg) -- Canada’s home sales skidded to the lowest level since 2012 last year after dropping for four straight months through December, as higher interest rates and tighter lending rules cast a pall over the real estate market. Nationwide, sales totaled 458,442 for the year, a drop of 11 percent which was the biggest since 2008, the Canadian Real Estate Association said Tuesday from Ottawa. The 2.5 percent December drop from the prior month was the most in eight months. Vancouver and Toronto led the slowdown in transactions. “It’s clear that higher interest rates are having an impact,’’ Benjamin Reitzes, a Canadian rates and macro strategist at BMO Capital Markets, said by phone from Toronto. “It was a difficult year and you are coming off a very strong run for housing,’’ he said, adding there is little chance of a “major comeback’’ in 2019. Vancouver sales fell 32 percent last year, the most since 2008, and Toronto sales declined 16 percent. Toronto showed some stability in December with sales flat on the month and benchmark prices up 3 percent from a year earlier. “The stress-test has weighed on sales to varying degrees in all Canadian housing markets and it will continue to do so this year,” CREA President Barb Sukkau said in the report, referring to new rules from the federal banking regulator. With mortgage lending fading to the slowest in decades, CREA cut its 2019 sales forecast last month to a 0.5 percent decline this year compared with a September prediction for growth of 2.1 percent. Vancouver’s average sales price was C$1.03 million ($780,000) in December, down 2.1 percent from a year earlier, and the Toronto average was C$750,180. Those markets are well ahead of the national average price of C$472,280.